Many organizations’ core businesses are project based nowadays. Otherwise also, companies run several projects simultaneously and many of them are interdependent on each other. In such a scenario it becomes necessary to effectively manage the projects individually and collectively. While Project management is a technique used for managing individual projects, Project portfolio management is a technique used to collectively manage various projects for benefiting the organizational goal and mission. The answer is Project management helps to manage a project effectively. But Portfolio management helps to do the same on a large scale and efficiently also. When there are multiple projects, the objectives may contradict each other. The benefits from individual projects may also not be equal. With the available resources and cost, the organization should prioritize and choose projects that will contribute to overall revenue growth. Project portfolio management is a task to perfectly manage all the above objectives. Managing individual projects will help only in effectiveness of that single project. 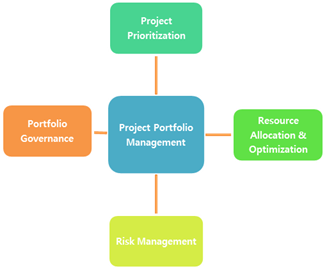 Project Portfolio Management standardizes the management technique across processes and also helps in reducing resource utilization and repeated tasks used in multiple projects. Project Portfolio Management is a centralized way of prioritizing, optimizing the use of resource for all the projects, managing individual projects to meet the overall objective of organization’s operational and financial goals. From a list of available options, only projects evaluated with the above characteristics, as eligible should be selected for implementation. Once the projects are finalized, all the projects should be allocated resources and manpower that helps the project to be completed as per the schedule. When a resource constraint arises, it should be allocated as per the priority towards goal maximization. Priority already determined may change during the course of time. Risk management is a very key task. Risk associated with each project should be evaluated accurately both during project selection phase and execution phase. Proper risk mitigation steps should be identified and implemented. Projects can be killed or eliminated if it poses a very serious threat to the organization’s goal and policies. The process of managing projects for schedule adherence, making interim changes to achieve the target, assessing performance, measuring KPIs, reporting benefits and accomplishment and other such activities collectively form part of Project Governance. Nowadays, there are various applications and software integrated via internet for governing the portfolio. Having learnt about the Project Portfolio Management, you should also know about its benefits so that you advocate for the technique in your profession and workplace. Optimizing the resources and cost, increases the efficiency and profitability of an organization. Having Risk management as a criterion, helps in avoiding and reducing the impact of known and unknown risk factors. Better governance and visibility of various KPIs of the portfolio. Thus Project Portfolio management acts as a framework for optimizing the projects benefits and managing multiple projects an easily achievable task for the management.